Crisálida: Community Arts Project | Locolandia Live! The night’s events began a couple minutes past 6:00P.M. 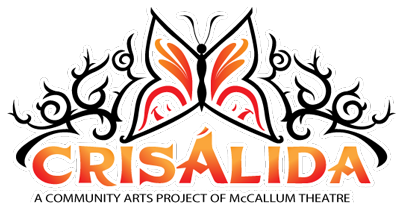 Crisalida-Arts project Manager, David Gonzalez, was host and master of ceremonies for the night. Dr. Lisa Soccio, art director and curator of the Marks Art Center, could be seen fastidiously prepping upcoming performers as Mr. Gonzalez opened the night with a poem he had prepared for the occasion. About 25 to 30 people were originally expected, but around the climax of the event there was easily 65 to 80 people in attendance. From College of the Desert (COD) students, to COD faculty, and other local students and educators, the audience in attendance was a potpourri of individuals. A spoken word performance accompanied by electric guitar background music. Local artist, and Hip-Hop performers such as RowLow, and Mario A. Giant were in attendance and highlighted the event with a poem/performance. Co-Founder of “Teatro de las Chicanas,” Chicana and women’s rights activist Felicitas Nuñez, also made her way out to Locolandia and presented a lecture on the yonic symbology of “Our Lady of Guadalupe” (The Virgin Mary). Ms. Nuñez related the iconoclastic and syncretistic properties that may be observed in postcolonial Mesoamerican art such as the incorporation of indigenous culture into colonial (European influenced) art, in this case The Virgin Mary. There was a 15 minute intermission where the folks in attendance were welcomed to tour the Mark’s art Gallery and observe Lalo Alcaraz’s art that was on display there. Mr. Alcaraz was kind enough to supply College of the Desert with about thirteen original prints of his syndicated comic strip cartoon “La Cucaracha,” which may be found on the LA Times Sunday edition, and countless other newspapers across the country. Initially the event began with folks reciting poems, songs, and/or spoken word orations inspired by one of Mr. Alcaraz’s prints on display at the Marks Art Gallery. As the night concluded the event turned into an open mic night as folks who wanted to speak but were not prepared jumped on stage and improvised an oration not necessarily inspired by Mr. Alcaraz’s art. Master of Ceremonies at “Locolandia Live!” David Gonzalez, closing the night with a poem. The concluding moments leading up to the event’s conclusion resembled a jazzed up 1960’s beatnik poetry reading as Mr. Gonzalez and two of the other performers (one on an electric guitar, and another playing a homemade drum set configured out of a rectangular wooden box and steal drum appendages) closed the night with a call and response type performance with engaged the audience to become part of the performance. The night concluded with a spoken word poem accompanied by the guitar player and wooden box drummer.